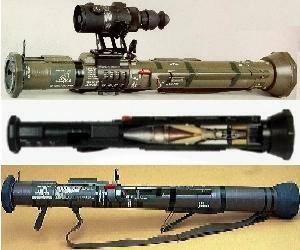 This is the Army's primary light anti-tank weapon. The M136 AT4 is a recoilless rifle used primarily by Infantry Forces for engagement and defeat of light armor. The recoilless rifle design permits accurate delivery of an 84mm High Explosive Anti-Armor warhead, with negligible recoil. The M136 AT4 is a lightweight, self-contained, antiarmor weapon consisting of a free-flight, fin-stabilized, rocket-type cartridge packed in an expendable, one-piece, fiberglass-wrapped tube. The weapon is man-portable and is fired from the right shoulder only. The launcher is watertight for ease of transportation and storage. Unlike the M72-series LAW, the M136 AT4 launcher need not be extended before firing. Though the M136 AT4 can be employed in limited visibility, the firer must be able to see and identify the target and estimate the range to it. Subsequent to the initial fielding of the weapon, a reusable night sight bracket was developed and fielded. It permits utilization of standard night vision equipment. The system's tactical engagement range is 250 meters and has been used in multiple combat situations. The round of ammunition is self-contained in a disposable launch tube. The system weighs 15 pounds and can be utilized effectively with minimal training. The AT4 HEAT is a low-trajectory, low-dispersion weapon and each preloaded shell carries an extremely effective shaped charge. The weapon has an effective range of 300 m and carries a warhead with unmatchable behind armour effect. It is this combination that gives the AT4 HEAT its ability to penetrate the armour of modern light armoured vehicles and devastate their interiors. The AT4 CS is an anti-armour weapon that is unique in its class. It has special internal ballistics, allowing it to be fired from confined spaces and it has a high hit probability out to 300 m. Both these features make it the only anti-armour weapon in the world that can be used to the full in urban combat. The AT4 CS HP is preloaded with a specially developed HP (High Penetration) warhead. This gives the system an armour penetration capability vastly exceeding 500 mm and the ability to defeat most types of tanks on the battlefield. To increase combat efficiency there are several training weapons available.